This is the film where I thought, "Wow, Leonardo DiCaprio has matured, finally." And it's not because he speaks with a Rhodesian accent here. I haven't really heard authentic Rhodesian, so I wouldn't know. But you can sense Leo's dedication to the art of acting, and it shows in every movement of his body, every twitch of his muscles. I think Orlando Bloom could've taken lessons from DiCaprio. Leonardo DiCaprio is living proof that great actors are made, not born. Jennifer Connelly always looks good on camera. I've liked her since Labyrinth. And she ages with such grace, I envy Paul Bettany. I like Djimon Hounsou when he acts normal. But when he starts shouting like a madman, like that "Give us us free" mode, he can sound pretty annoying. It's like a caged animal that will kill the first person it comes into contact with. Now isn't that frightening? 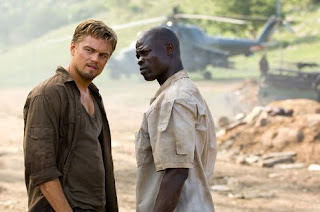 Blood Diamond. USA/Germany. 2006 (2007 Philippines).